Photoreactor Farm Tower is an active landart piece which takes Dubai’s underused context elements as a chance to start the new energy revolution and produce alternative fuel. The context elements are the Sea (used as an algae tank), the Desert (used as an infinite algae field) and the Sunlight (used to grow algae). The Photoreactor Farm Tower (PFT) is an active artifact. The algae fields are an artistic installation made of illuminated vertical green glass tubes with algae in them. By going vertical, you can get a lot more surface area to expose cells to the sunlight. It keeps the algae hanging in the sunlight just long enough to pick up the solar energy they need to produce, to go through photosynthesis. 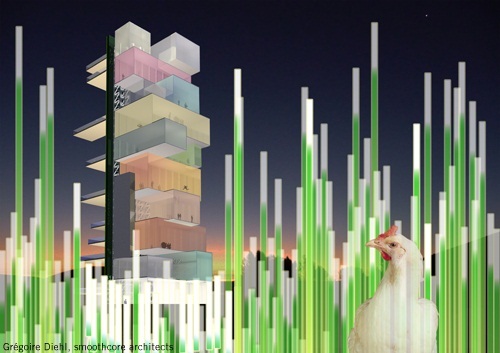 The PFT is an architectural landmark in which takes place technical (substation-separator), educational (DEBFAU-Dubai Energy and Bio Fuel of Algae University), research (DLAER- Dubai Laboratory for Algae Energy Research), vertical farming (fruits, green cows, green chicken…) where animals eat algae food, French bio market (to buy twice a week fresh and bio food) and recycling (RABIT- Recycling Algae Biomass Institute of Technology). Dubai may be best known for “Big Oil.” But the oil that could some day make a dent in the country’s use of fossil fuels is small. Microscopic, in fact: algae. Literally and figuratively, this is green fuel. 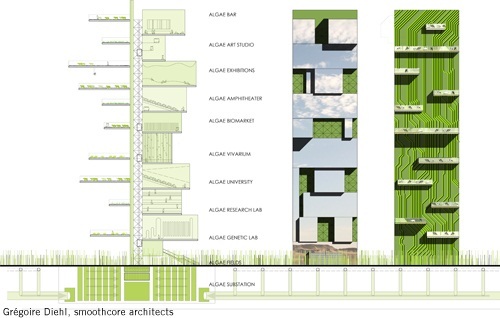 The PFT team (architects, artists, researchers, landscape architects) believes algae can someday be competitive as a source for biofuel. The plant is a giant solar collecting system getting the bulk of its energy from the sunshine. Algae are among the fastest growing plants in the world, and about 50 percent of their weight is oil. That lipid oil can be used to make biodiesel for cars, trucks, and airplanes. Pond scum can be turned into fuel. Most people know algae as “pond scum.” And until recently, most energy research and development projects used ponds to grow it. But open pond cultivation involves a lot of land area, with inherent problems of evaporation and contamination from other plant species and various flying and swimming critters. But instead of ponds, the PFT uses a closed, vertical system, growing the algae in long glass illuminated tubes. A pond has a limited amount of surface area for solar absorption. By going vertical, you can get a lot more surface area to expose cells to the sunlight. It keeps the algae in the sunlight just long enough to pick up the solar energy they need to produce, to go through photosynthesis. The PFT can produce about 100,000 gallons of algae biofuel a year per acre, or the equivalent of 2,500 MWh of electricity. There are about 65,000 known algae species, with perhaps hundreds of thousands more still to be identified. Part of the operation of the PFT will be to house research activities that will identify the best species.